Last Friday, 102 years to the day after he was buried in his local family cemetery, a member of South Haven congregation finally got a headstone for his grave. When he died on Apr. 9, 1912, newspapers across the nation carried the news of his death, including the Boston Journal, the Evening News of Sault Ste. Marie, Michigan, the Evening News of San Jose, California, and the Seattle Daily Times of Seattle, Washington, as well as the New York Times and local papers on Long Island. His funeral was held in the South Haven Church on Apr. 11, 1912, and he was interred in the family cemetery, which is located north of the LIRR, east of Yaphank Ave./Old Stump Rd. and west of Old Barto Rd. The year before his death he had completed the construction of his second railroad in Alaska for which he had been the Chief Engineer. His last railroad was constructed for the copper mining interests of J. P. Morgan and the Guggenheims. His family was living in Seattle when he fell ill in New York and his wife and two children arrived the day after his death. In 1930, a peak in a mountain range in Alaska was named for him, Mount Hawkins. 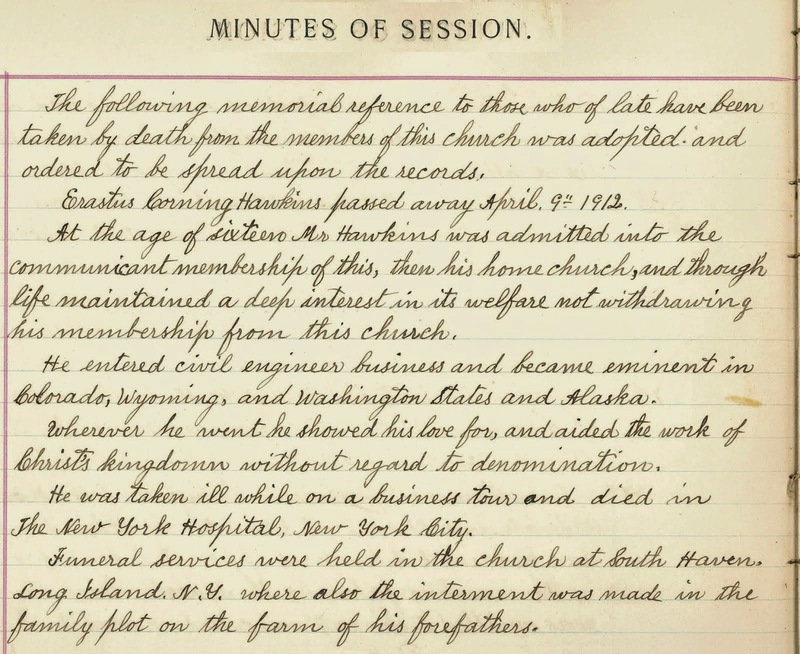 And even today, there is a lesson-plan for use by high school teachers in Alaska to inform the young people of Alaska about the great achievements of E. C. Hawkins, who was born in our community and was a member of our church. Last Friday, four of his direct descendants: great-grandson and great-granddaughter from Seattle, and his great-great granddaughter, and great-great-great granddaughter from near Washington, DC, came to Brookhaven to witness the unveiling of their ancestor’s new monument. His second Alaskan railroad was the Copper River and Northwestern Railway. His “Million Dollar Bridge” is still a tourist attraction and is now used for automobile traffic. E. C. Hawkins’s son, Mason Hawkins, grandfather to two of our guests, worked on the railroad also. I gave the family a tour of our church. E. C. Hawkins’ brother, Emmett, had served as a trustee and elder of the congregation, and his sister-in-law, Mattie (Whitson) Hawkins, was our congregation’s first woman elder. In fact, many of their ancestors, who are buried in the same cemetery, were officers of the South Haven congregation. 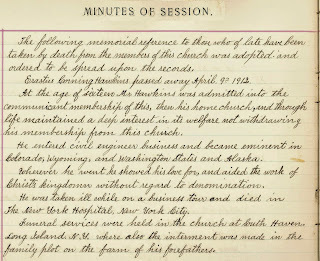 The two handouts I gave to members of the family, which describe the relationship of their ancestors to the South Haven congregation, are attached (HawkinsEC_dedication,pdf and DavidHawkinsCemetery_SouthHavenChurch-officers.pdf). https://play.google.com/books/reader?id=R75ZAAAAYAAJ&printsec=frontcover&output=reader&authuser=0&hl=en_US&pg=GBS.PA419 “Building a Railroad into the Klondike” by Cy Warman, McClure’s Magazine, January, 1900. “It Had to Be Done” by Carlyle Ellis in Technical World Magazine, March 1912.